Payroll changes often happen at the beginning of the calendar year, and nanny tax related changes are no different. The HomeWork Solutions household payroll experts have assembled a short overview of changes a nanny employer, employer of a senior caregiver, or any household employer needs to know. Minimum Wage: 24 states and numerous localities will raise their minimum wage January 1, 2015. Please check your household employee's hourly pay rate against your state's minimum wage to insure compliance. "Nanny Tax" Wage Base: The annual wage threshold that triggers a household employment tax obligation remains unchanged at $1900 or more of wages paid to the employee in a year. 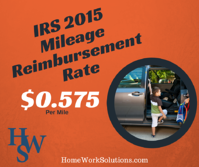 Mileage Reimbursement: The IRS standard business mileage reimbursement rate will go up to 57.5 cents per mile January 1, 2015. Most families reimburse their household employee's work travel in the employee's personal vehicle at this rate. Federal Income Tax Withholding: The IRS has published updated 2015 income tax rates. HWS is in the process of updating our online calculators and will have these new tax rates available prior to the issuance of first paychecks in January. If you write your household employee's paycheck yourself, make a note to visit our online paycheck calculator prior to issuing your first 2015 payroll. Pay Rate Notices: Household employers in California must provide their household employees with a pay rate notice in January 2015. New York eliminated the annual notice requirement for 2015. In California and New York a pay rate notice is due at time of hire and whenever there is a change to pay rates. Household employers in the District of Columbia must provide their employees a pay rate notice no later than March, 2015.